Home Your Health Resources Drugs, Procedures & Devices Procedures & Devices What is a Total Contact Cast? A total contact cast is a cast used to treat ulcers (serious, deep sores) on a person’s foot. It consists of a fiberglass or plaster shell with a bar on the bottom. The shell fits around your leg and foot very closely. It follows the shape of your whole foot. That’s why it is called a total contact cast. It is designed to distribute weight along the entire sole of the foot. The cast helps to protect the skin on your foot. Where the cast sits under the ulcer, there is a layer of soft foam. This makes a space so that no pressure is put on the sore. This allows it to heal more quickly. The cast has only a small amount of padding around the rest of the foot. The bar on the bottom helps keep weight off of the sore when you are standing or walking. Who needs a total contact cast? Total contact casts are used by people who have diabetes. Diabetes can cause problems with the feet. A complication called neuropathy can cause a loss of feeling in the feet. This can make it hard to tell if you have a blister or sore on your foot. Small sores can turn into big sores fast. If small sores aren’t taken care of, they can get worse and turn into ulcers. The total contact cast takes pressure off the ulcer. This will help your ulcer heal. If you keep walking without the cast, the ulcer won’t heal. Wearing a total contact cast helps most ulcers heal in 6 to 8 weeks. Your doctor will probably change your cast 1 to 2 days after it is put on. After that, you’ll probably get a new cast every week until you are ready to wear shoes. 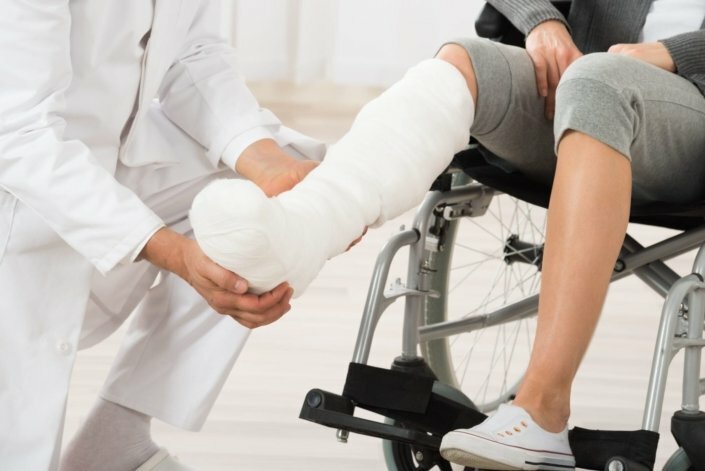 What do I need to know about my cast? Depending on the type of cast you have, the cast will take either 30 minutes or 24 hours to dry after it is first fitted. Your doctor will tell you what kind of cast you have. It is important that you don’t put any weight on the cast while it’s drying. You’re less stable when you’re wearing a cast. Your chances of falling and hurting yourself are increased. The less you walk, the less likely you are to fall. Be very careful on slippery or uneven ground. Use a cane for added stability, even if you usually don’t use a cane. If you were already unsteady before wearing the cast, it is a good idea to use a walker. No, the cast needs to stay dry. You won’t be able to take regular baths or showers. Take sponge baths instead. Try not to go outside when the weather is wet. If you must go outside when it’s wet, wrap your cast in a plastic bag. Here are a few other tips that may help you. You may have some itching under the cast. Don’t slide anything down the cast to scratch the itch. You could easily damage the skin underneath. When you’re sitting down, put your leg up on a chair or pillow whenever possible. While you’re sleeping, you might kick or rub your other leg with the cast. This could cause skin damage on your other leg. It is a good idea to put a thick, soft, knee-high sock over your other leg before you go to bed. Or put a pillow between your legs. If you would like more information on how diabetes affects your feet, ask your doctor. Remember that you don’t have good pain sensation (ability to feel pain) in your leg or foot. So you might not be able to feel if something is wrong. You must check your cast (or have someone else check it) every day. Call your doctor if you notice any of the following. The cast is loose. The cast should fit your leg securely. If it becomes loose, it could rub against your leg or foot and cause a new sore. A space of more than 1/4 inch between your cast and your leg is too much. Dents, cracks, and other damage to the cast. A dent or other damage can apply dangerous levels of pressure to your leg that you might not be able to feel. A smell coming from the cast. This could be a sign of a wound infection that started after your doctor put the cast on. Fever (temperature of 100°F or higher) or a sudden, unexplained increase in your blood sugar levels. These also could be signs of infection. You are having a lot of pain in your back or hip. You get the cast wet. You are having problems with your balance. How will the total contact cast help? Why do you need to change the cast? How can I avoid getting ulcers in the future?